Maybe Google bought the wrong company. What would you pay for a phone with a 6-inch OLED screen, Snapdragon 835 processor, 8GB of RAM, 128GB of storage, and a 3,300mAh battery? $850? $950? Now consider this number: $390. That’s the difference in price between the 128GB OnePlus 5T and the Pixel 2 XL. For $559 (just $20 more than the OnePlus 5), you get a phone that looks an awful lot like a Pixel 2 XL, with slim bezels, a rear fingerprint sensor, and an OS that’s very faithful to stock Android. And the entry-level model costs less than $500. I've spent only a brief time with the 5T so far, but it's left me with a stronger first impression than I got from the OnePlus 5. It feels premium. It looks premium. And it still has a headphone jack. The OnePlus 5T might be a mid-cycle refresh to the OnePlus 5, but it feels like an entirely new device. When the OnePlus 5 was released in June, it had the flagship specs that we’ve grown to expect—Snapdragon 835 processor, 6GB/8GB of RAM, dual camera, 3,300mAh battery—but its display and design left a little to be desired. Samsung and LG had already introduced smartphones with slim bezels and 18:9 screens, and the OnePlus 5’s capacitive keys, front-facing home button, and 5.5-inch 1920x1080 display felt stale. You don’t need to even pick up the OnePlus 5T to see how different it is. 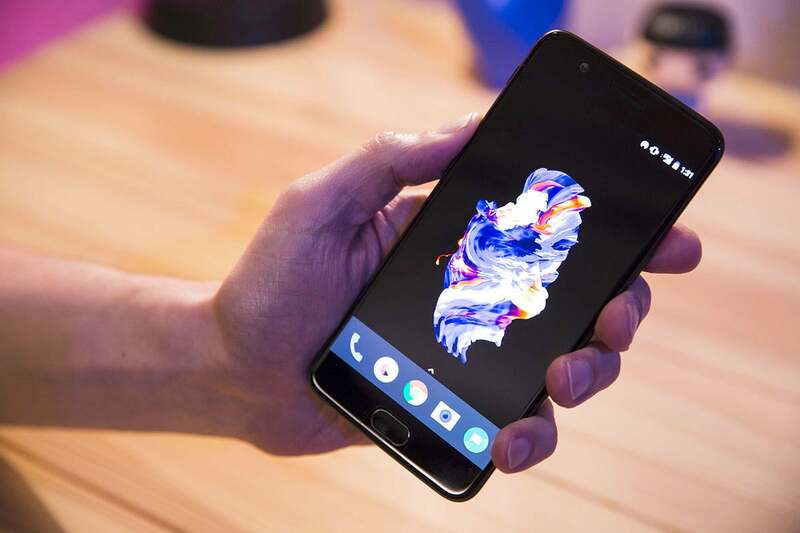 While the OnePlus 3T’s changes were all under the hood, the 5T’s screen has been expanded to six inches, and the bezels have been shrunk to keep the dimensions roughly the same. The side bezels are skinnier than the Pixel 2 XL’s but not quite edge-to-edge. While they lack the dramatically curved corners of the Pixel 2 XL or iPhone X, they’re not completely square, either. The OnePlus 5 had the same buttons and 5.5-inch AMOLED screen as the 3 and the 3T. There’s no more room for a home button, so the fingerprint sensor has been moved to the back, which is made of the same anodized aluminum as the OnePlus 5. That means it still doesn’t support wireless charging, but it’s just as good to hold as the Pixel 2 is. Overall, it feels modern in a way the OnePlus 5 doesn’t. As for the camera, OnePlus says it's tweaked its algorithms for better low-light performance and portraits. While the megapixels on the camera are the same (16MP+20MP), the secondary lens is upgraded with an f/1.7 aperture. I’ll need a little more time with it to see how much it’s improved, but it’s good to see OnePlus addressing one of the 5’s biggest pain points. 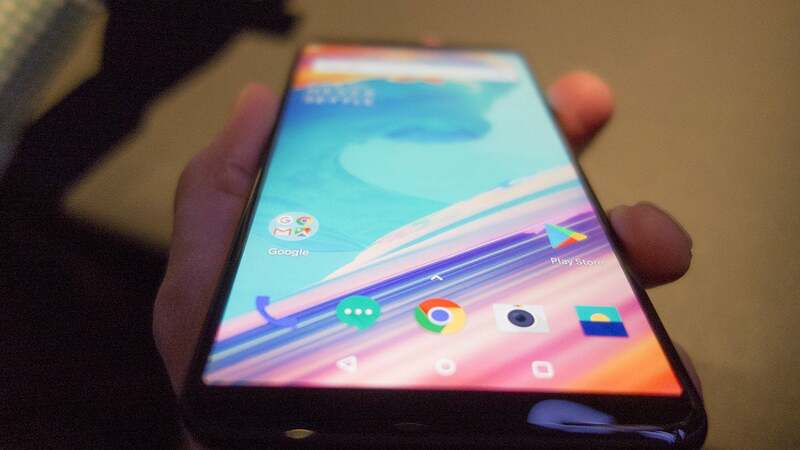 OnePlus’s OxygenOS has always stayed fairly faithful to stock Android, but as I watched the 5T’s unveiling in Brooklyn on Wednesday, it struck me just how much they care about Android. The first half of the presentation was all about its software, and not just some new or gimmicky features. Brian Yoon, head of the user experience at OnePlus, spent some 20 minutes talking about how OxygenOS respects the core values of Android. The OnePlus 5T is still based on Android 7.1 Nougat, but OnePlus has added some unique touches to freshen it up. Most interesting is a feature it calls Parallel Apps, which lets you clone apps so you can run two different versions of it. That means if you have two Twitter accounts, you can have two versions of the Twitter app, each with its own login. It’s a neat idea that I could see Google adopting for a future version of Android. There’s also a new face unlocking biometric that uses “over 100 identifiers” to learn your face. It works fast, but this isn’t Face ID-level scanning. It’s only using the regular camera, so there’s no 3D scanning, and OnePlus won’t let you use it for payments or logins (which is a good thing). From the design to the specs to the OS, the only real advantage the Pixel 2 XL has over the OnePlus 5T (other than Verizon support) is Android Oreo. That’s a major one, of course, and even though OnePlus says an update should arrive in early 2018, the Pixel will probably be on 8.1 or 8.2 by then. 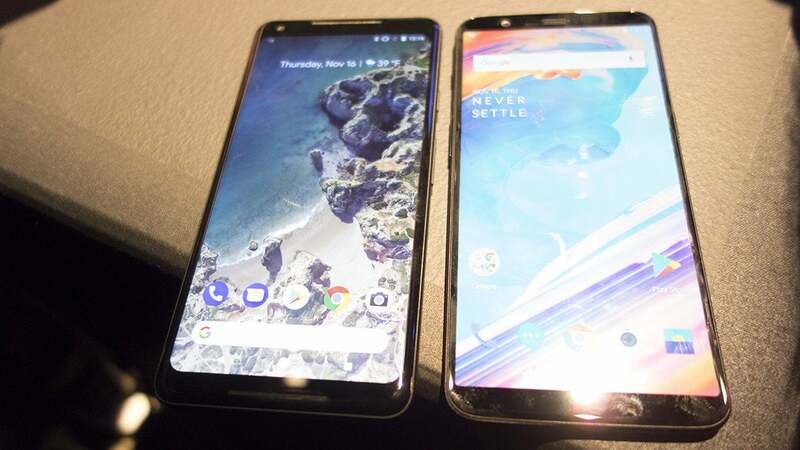 The OnePlus 5T (right) is strikingly similar to the Pixel 2 XL. But I can't help but wonder what could have been. Google made a splash earlier this year by scooping up 1.1 billion dollars' worth of HTC’s smartphone talent, a move that will streamline the Made by Google campaign by bringing the entire Pixel team under one roof. But no matter what the fusion of teams brings to next year's Pixel 3, there’s one thing that’s certain: It’ll still cost at least $800. Maybe Google bought the wrong company. Because now the OnePlus 5T has me dreaming of a $500 Pixel.